I was meeting my friends in Penn Station and since I was, as usual, early, I did some sketching while I had some coffee. 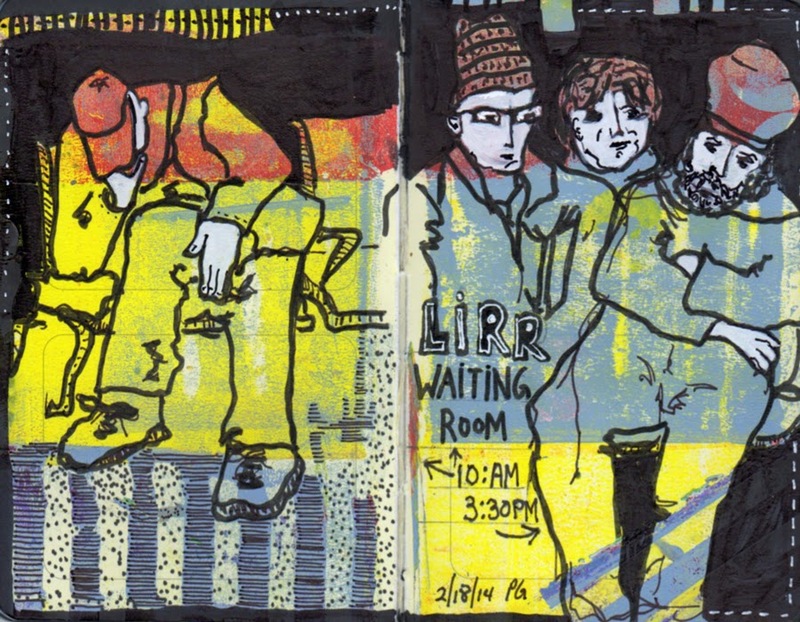 The pages in my Moleskine journal are all prepainted with acrylic paint using the Gelli Printing plate - a failure proof surface for doing hand-pulled monotypes at home. I do the drawings from life and then add finishing touches later on at home. 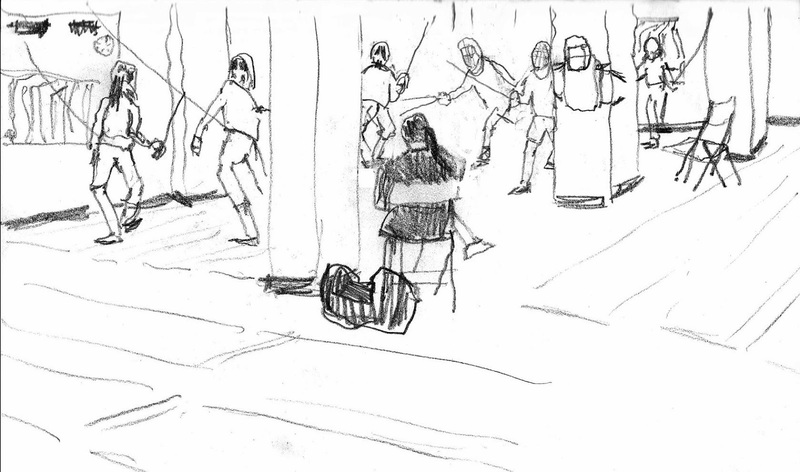 Sketching at the Manhattan School of Fencing from Mark Leibowitz on Vimeo. You are welcome to join any or all of the activities. 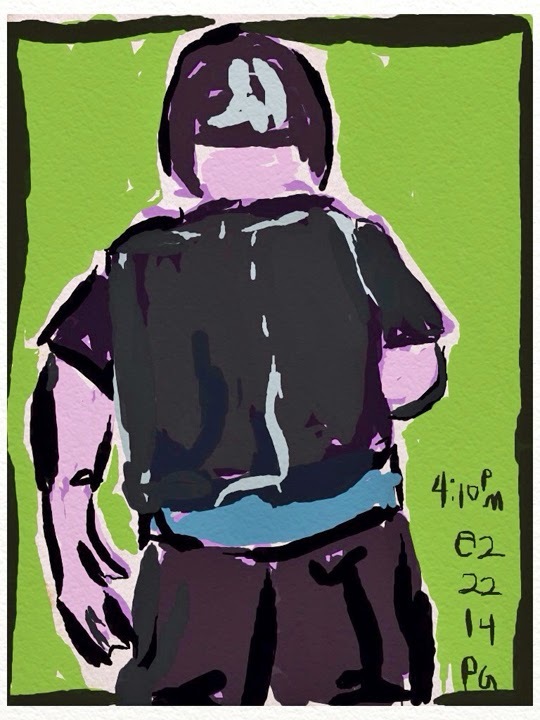 The life drawing class runs from 9:30 - 12:30. It's a popular class and the best seats are taken quickly. The class often fills to capacity. Minerva will teach short anatomy lessons during the breaks. 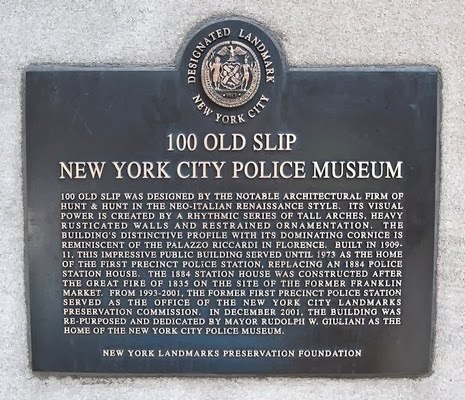 Dedicated to preserving the history of the New York City Police Department the world largest and most famous police service. 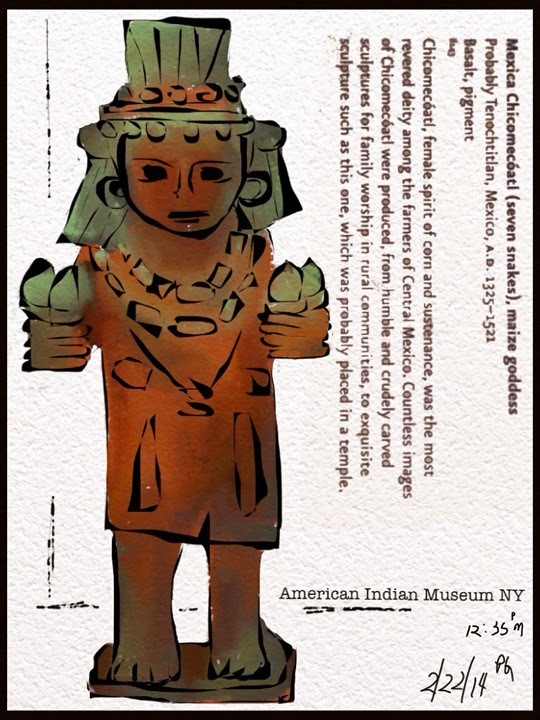 Price: $5 per person (Your suggested admission supports the rebuilding fo the Museum due to the impact of Hurricane Sandy. This is a limited attendance sketching event. We are only allowed ten people. So, please let me know by email as soon as possible if you plan to join us for this part of the sketch day. We will meet at 4:30 at Triangulo, NYC's only dance studio dedicated exclusively to the Argentine Tango. The stylish sensuous beauty of the Tango has made it the subject of many artists. Price: $10 per person to cover the wine and refreshments. 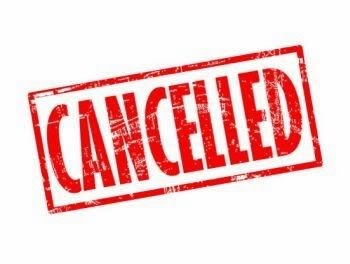 Friday, February 28, 6:30–8:30 p.m. Draw inspiration from original works of art. 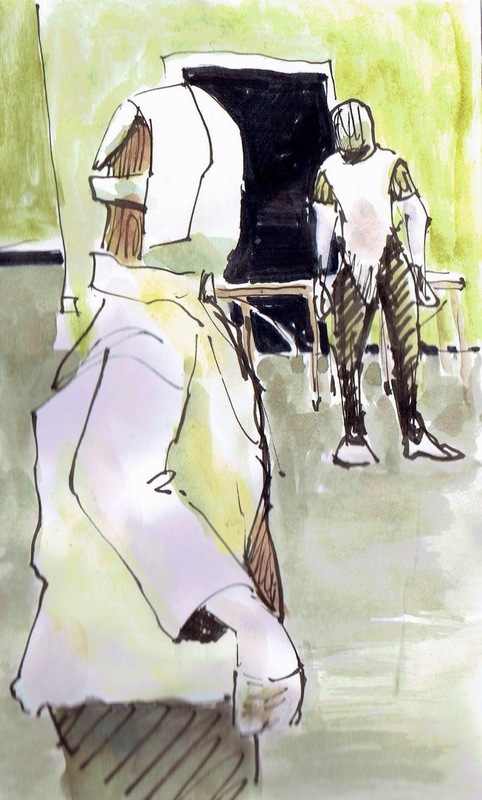 Join talented art instructors in the galleries for informal sketching fun. Materials are provided, but you may bring your own sketchbook; pencils only. Instruction provided every thirty minutes. Come and go as you like between each session. Open to visitors of all ages. Not so easy. 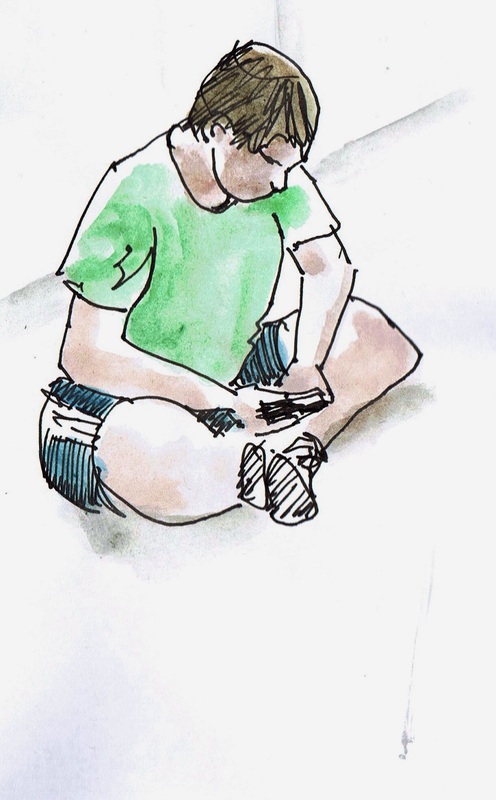 Sitting and watching with the intention of sketching, the first thing you notice is there's constant motion. 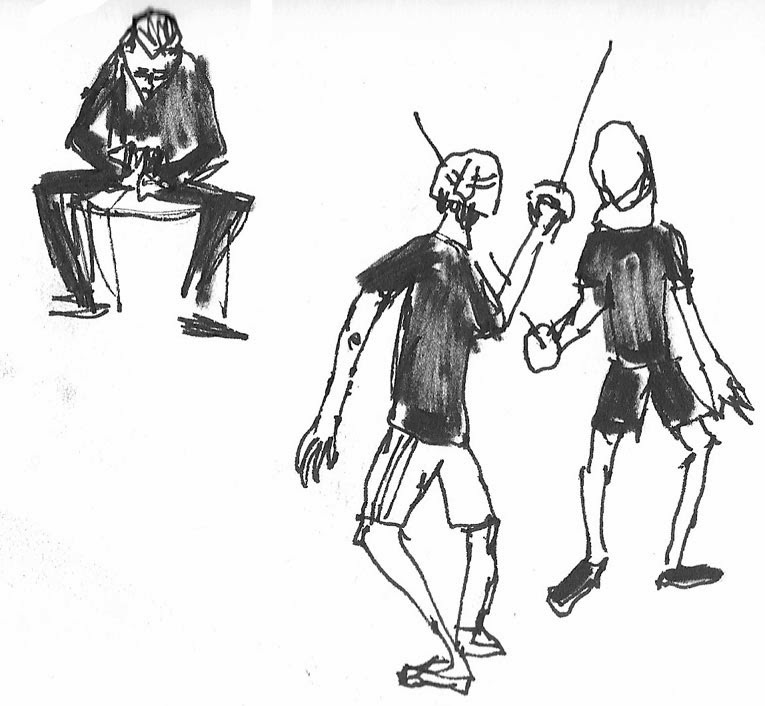 Further study and you detect that the fencers invariably have a moment when they pause before an attack. It's a moment that quivers with energy. Then you notice there's a repetition to what's happening, like the beats and steps in a ballet. 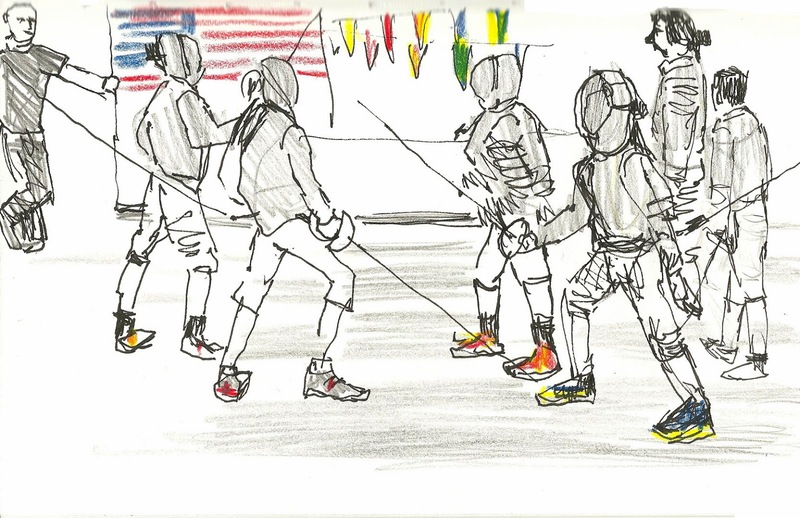 The school is a testimony to the wholesomeness of the sport of fencing. There's a large sign that features the names of students who have gone on to prestigious universities. Even more impressive is the sign that shows students who have competed in the Olympics. 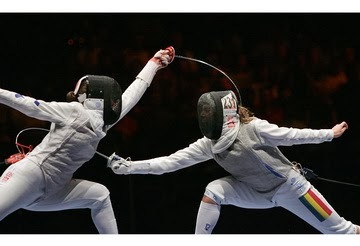 The last thing you notice is that fencing is a thorough and exhausting workout. 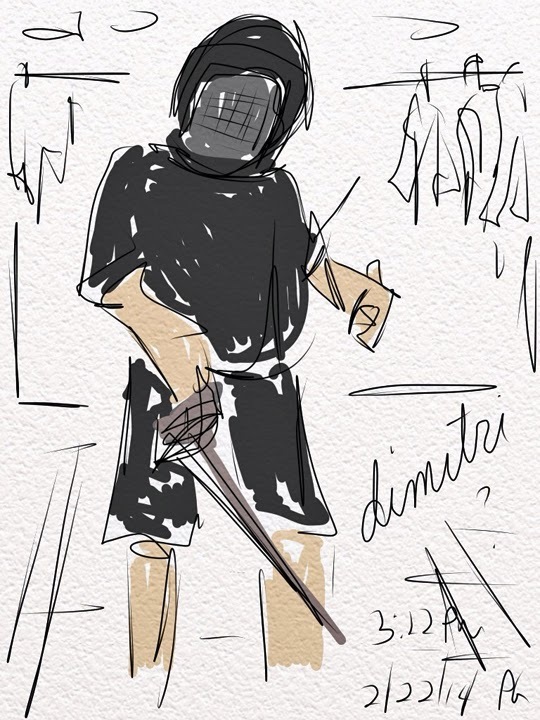 This last sketch is of a fencer who sat on the floor texting after his workout with a private coach. He was drenched in sweat, but seemed pleased with the session he'd just completed. Many thanks to Julia Gelman who gave us special permission to visit her school. The teachers and students could not have been more hospitable. We, (about 13 of us), ended up at Manhattan Fencing. The guy covered in black protective gear is the instructor. The fellow in the t-shirt kept practicing the same moves. Which was helpful from my standpoint. And then his lesson was over. He sprawled on the floor. 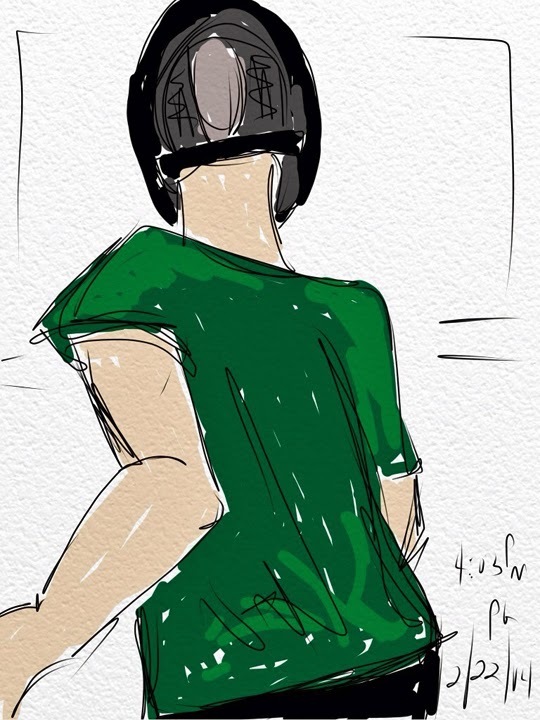 iPad; Sketchbook Ink, Finngr Pro apps; New Trent Arcadia stylus. 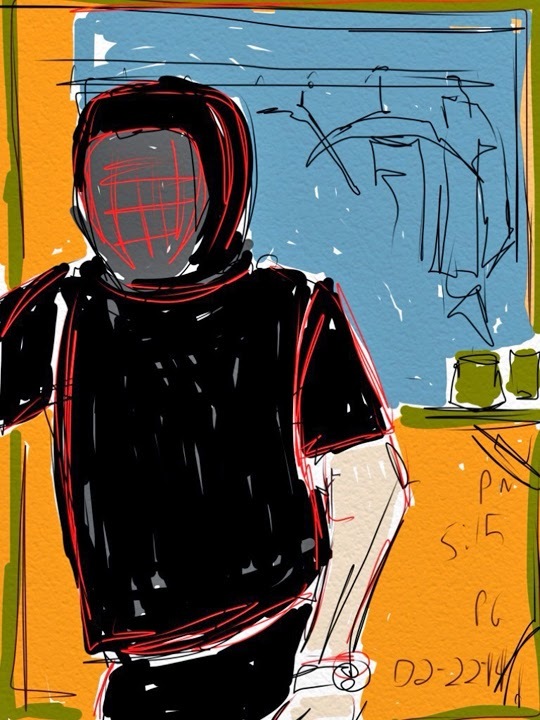 All drawings were completed in the fencing school and just exported to ArtRage for the textured background. 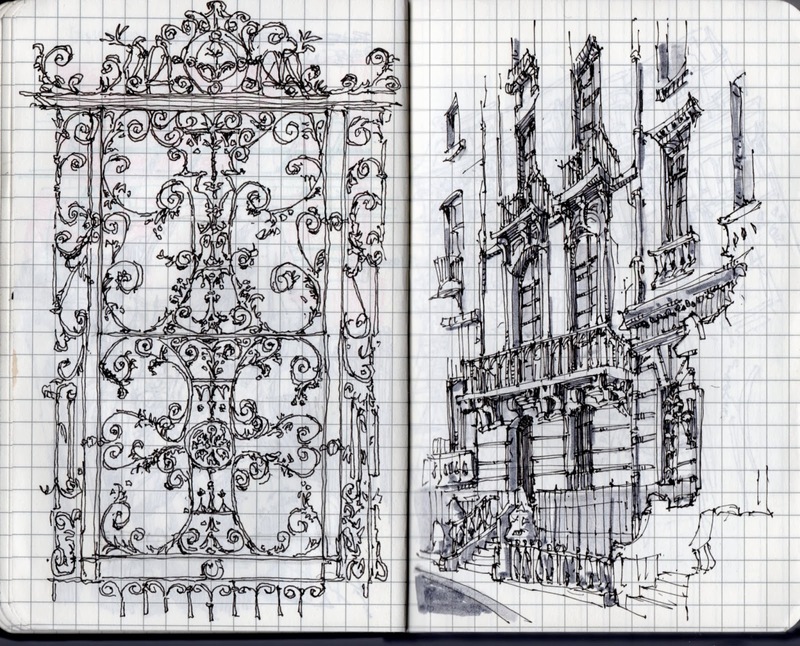 Urban Sketchers Sketch Seminar coming to Chicago June 7th and 8th, 2014! Urban Sketchers Chicago will be hosting their very own sketching weekend in the great city of Chicago on June 7th & 8th, 2014. The event will attract local and visiting sketchers from near and far. 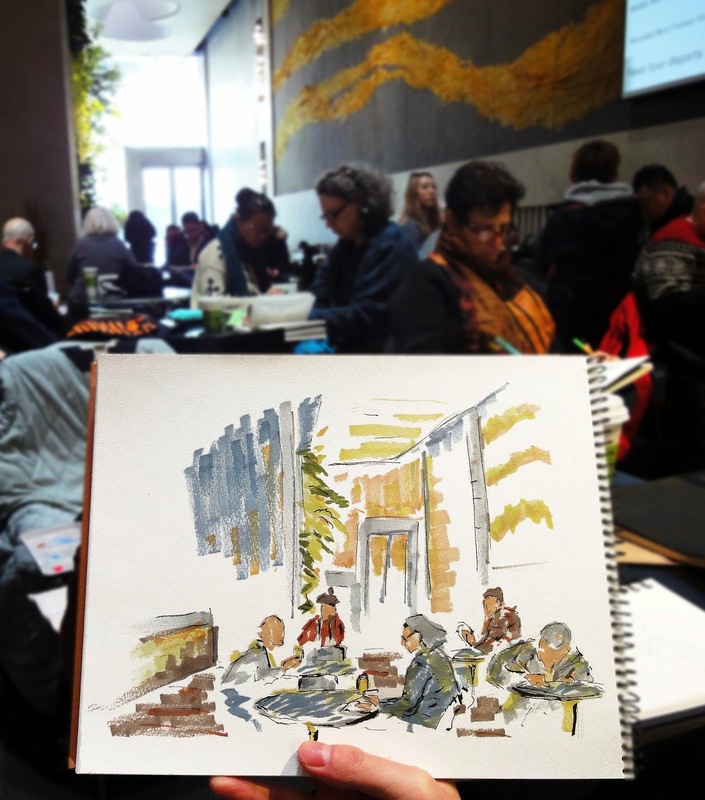 While sketching at various locations throughout downtown Chicago, some of the most respected and qualified instructors will be teaching workshops surrounding topics like on-location sketching, color theory, and choosing what to sketch, just to name a few. Registration is required. We are excited to announce that the location for the seminar will be in and around Palette & Chisel, Fine Art – Chicago: Art Classes & Open Studios. Palette & Chisel is located at 1012 N. Dearborn St., Chicago, IL 60610. Learn more about Palette and Chisel here. 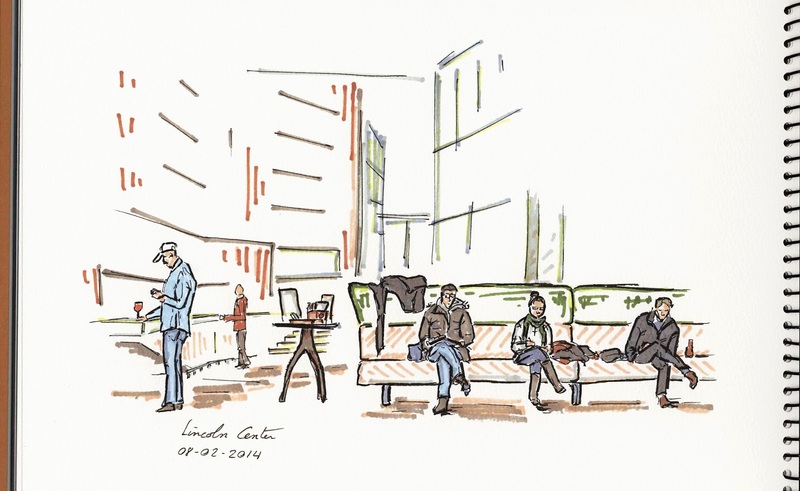 Urban Sketchers (USk) is a global community of artists that practice drawing on location in cities, town, and villages in which they live, work or have traveled. It is a nonprofit organization that is dedicated to raising the artistic, storytelling and educational value of location drawing, promoting its practice and connecting people around the world who draw on location. 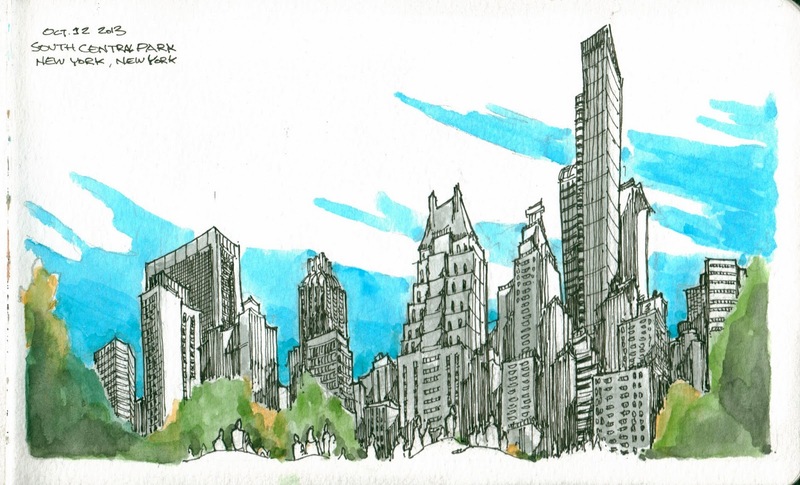 Don’t miss the USk Chicago Seminar coming June 7th & 8th, 2014. Follow us onFacebook, Twitter, Instagram and Pinterest and on our blog for further information regarding the seminar, to see our sketches, and to begin sharing your own! 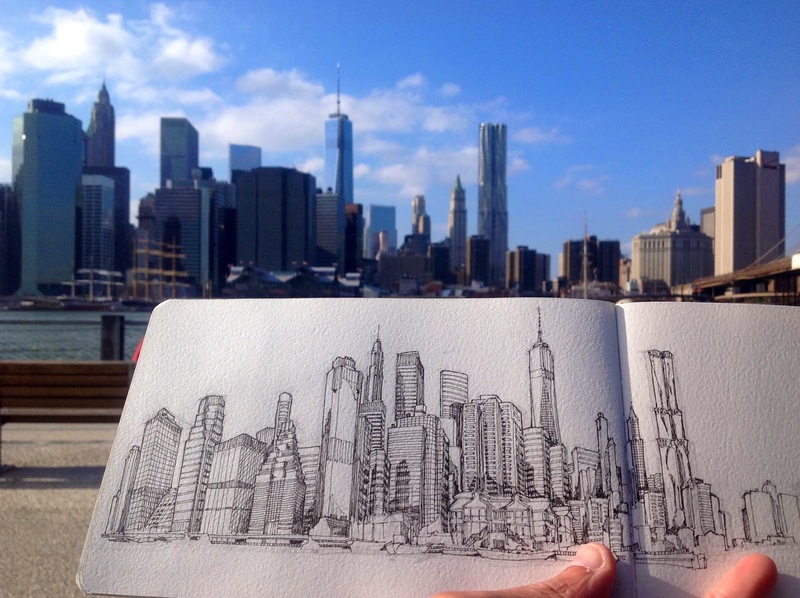 The New York Urban Sketchers had big plans for yesterday, Saturday. There was a morning location, an afternoon location and an in-between location. 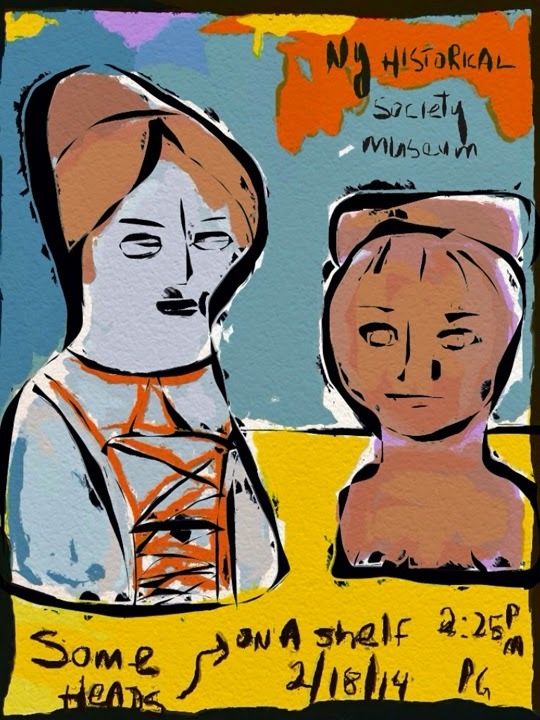 Instead of joining them for the morning figure drawing on Spring Street I opted instead to revisit the American Indian Museum NY since the George Morrison exhibit is closing. 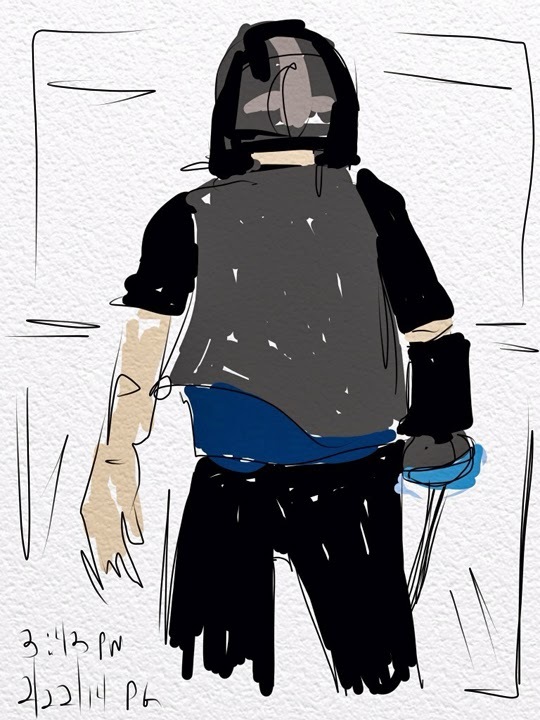 I wanted to remember facets of this particular sketch so I quickly copied it using a very simple app so that I wouldn't get bogged down. I saw this exhibition last October and was blown away by the beauty of his artwork but I had very little time and wasn't able to copy anything. Yesterday time wasn't a problem. I hopped back on the #1 subway to the Times Square station. For the in-between portion we were meeting in Times Square. I called Mark to find out where, got his answering machine, didn't spot anyone I knew among the million or so tourists milling about on Broadway so I went to the 8th floor lobby of the Marriott on Broadway and 45th Street. 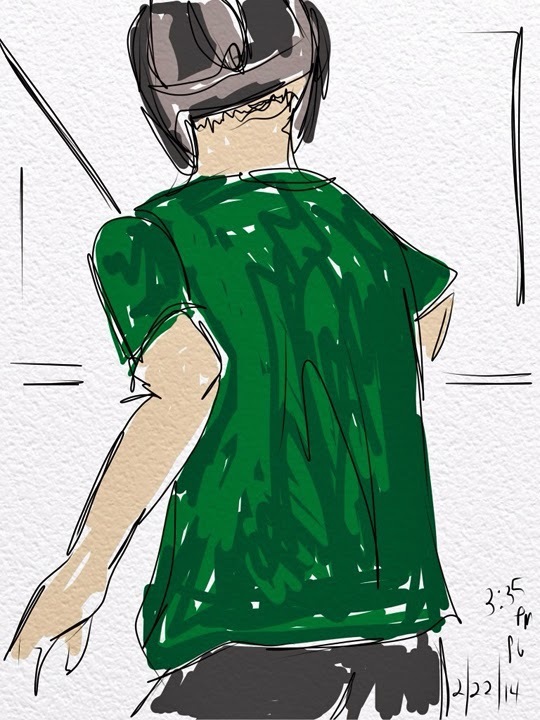 While I waited, I sketched a couple of people as they waited for each other to use the rest room - they were a bit too quick. Mark returned my call and soon enough there he and a few other sketchers were. 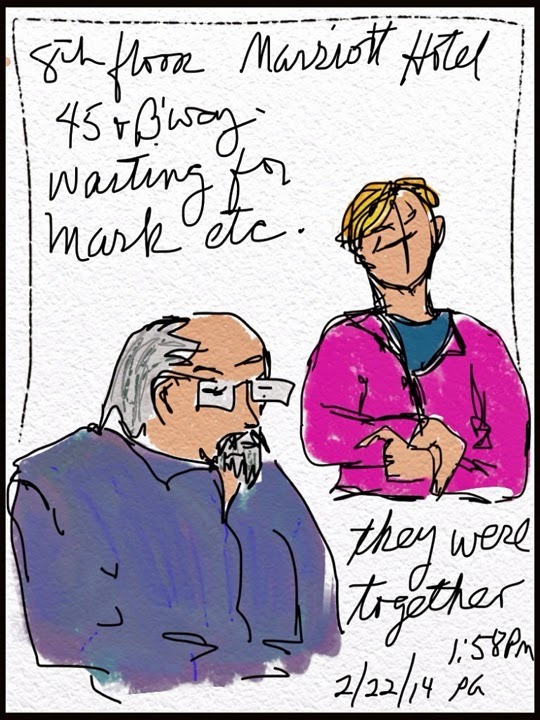 We talked for awhile and then walked to 39th Street where a unique sketching experience awaited. 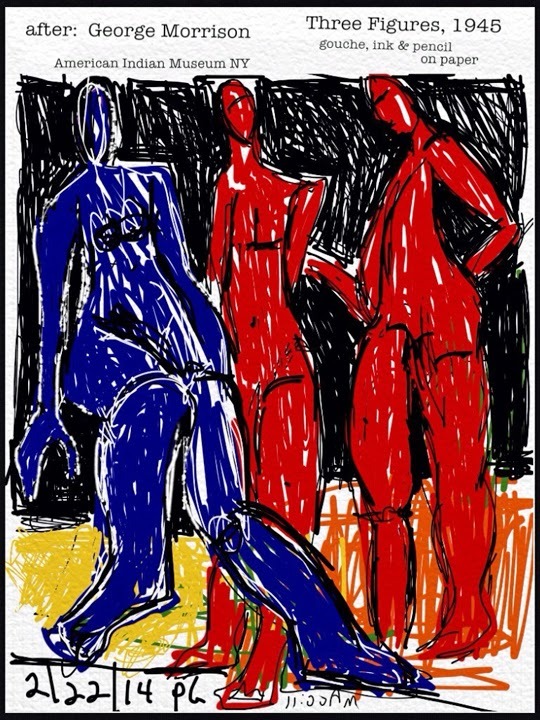 iPad; Penultimate, ArtRage and Sketch Club apps; New Trent Arcadia stylus. 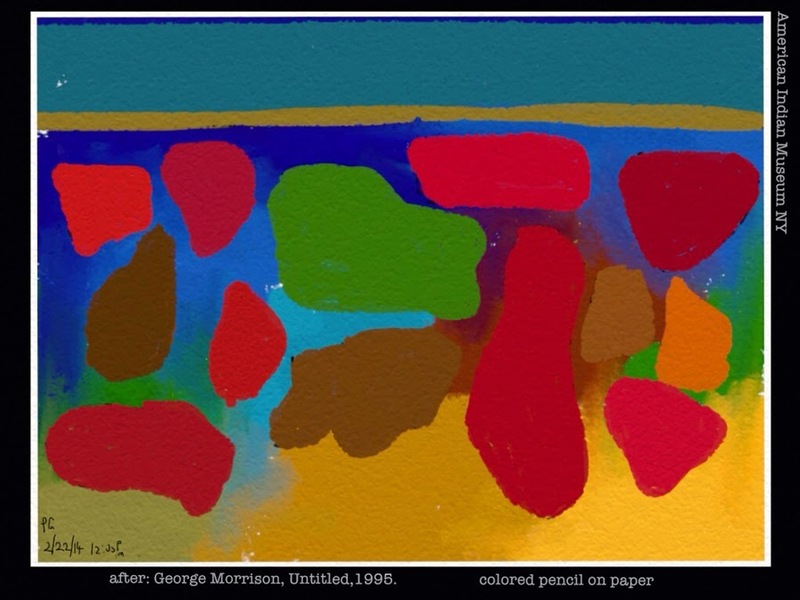 Only the text in the George Morrison pieces were added later at home. Everything else was completed while in the museum. At the Manhattan Fencing School. Challenging but fun! Wouldn't you know it. I had plans to meet up with visiting-from-North Carolina-friends Gwen and Phil Diehn in the city and it SNOWED! We decided to ignore the idea and actuality of the existence of SNOW and met in Penn Station. We took the subway uptown (snow had stopped) to the New-York Historical Society Museum & Library where we viewed the exhibition "The Armory Show at 100: Modern Art and Revolution". From their website: " In 1913, the International Exhibition of Modern Art came to New York. Organized by a small group of American artists and presented at the Lexington Avenue Armory (and thus nicknamed the Armory Show), it introduced the American public to European avant-garde painting and sculpture. This exhibition is an exploration of how the Armory Show inspired seismic shifts in American culture, politics, and society." Gwen has embarked on doing 10,000 drawings so afterward we looked for "things" to draw. On the 4th floor we found a Treasure Trove of Things Things and More Things. Follow the link and scroll down and take a look at the list of Things Categories. Wow. It was the coolest place ever. 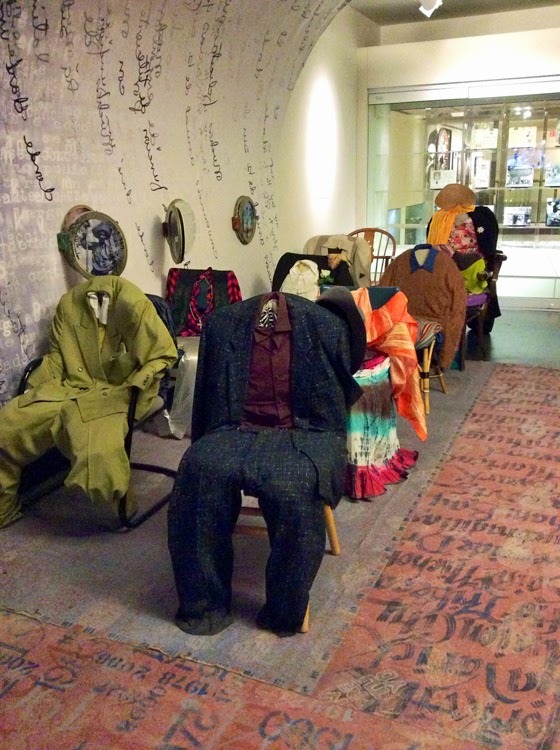 According to the information card on the wall: "The seats are dressed as immigrants so visitors can sit on their laps, literally placing themselves in their position." 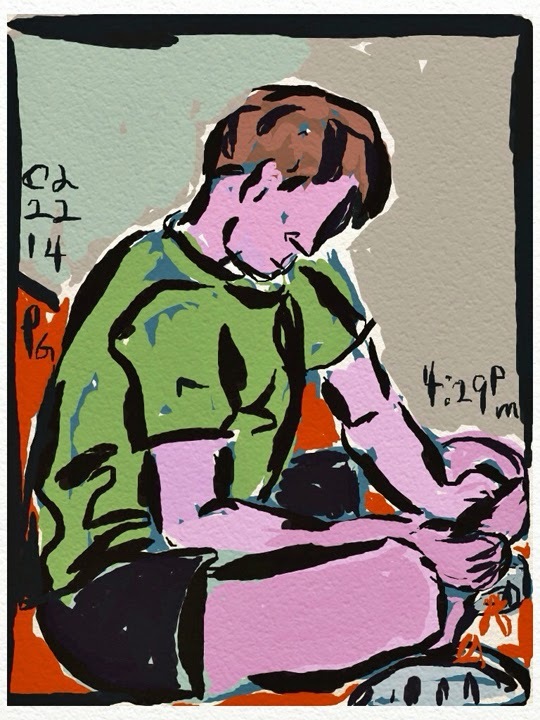 Top images: iPad; Sketch Club, Finngr Pro, Glaze, ArtRage apps; New Trent Arcadia stylus. 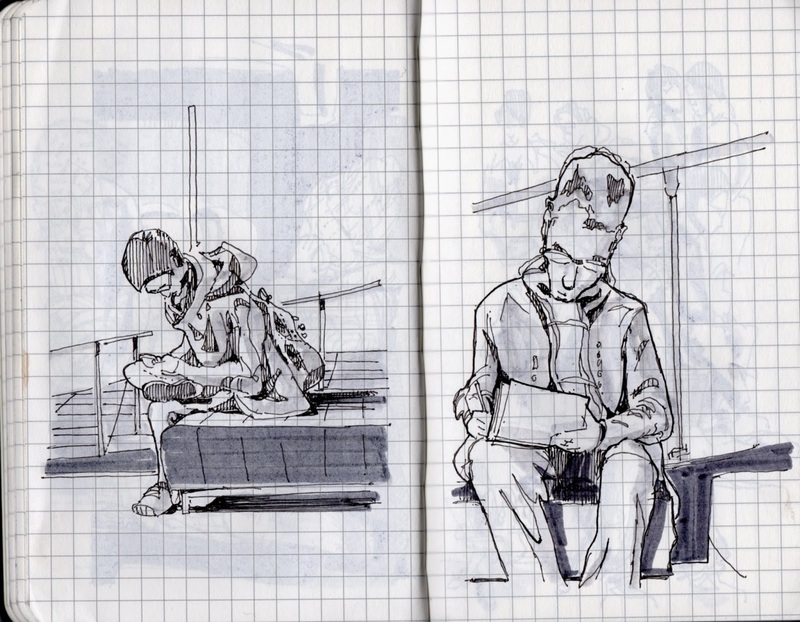 Final image: Figures drawn from life while in the LIRR station waiting room. 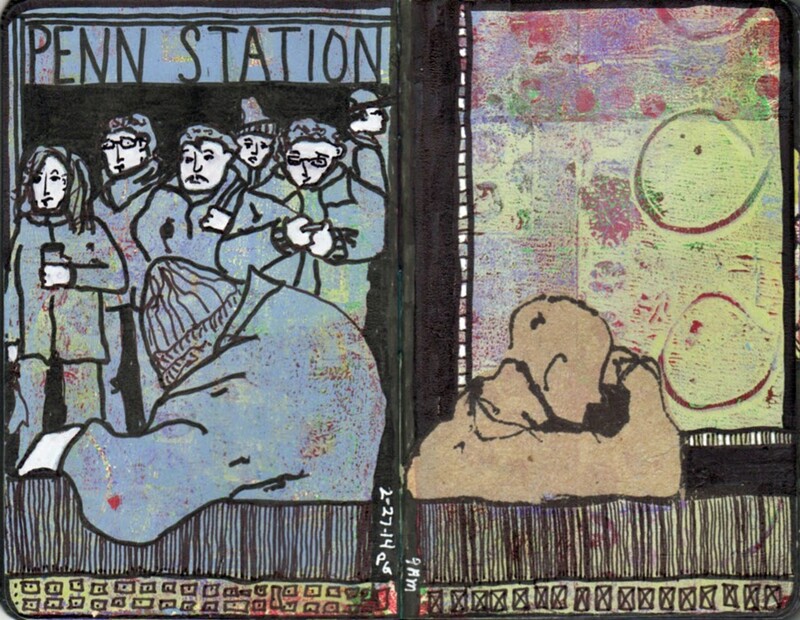 Moleskine journal with Gelli Printing Plate monotype background; Sharpie fine point, chisel and white oil paint markers. An interesting day is planned for this coming Saturday. 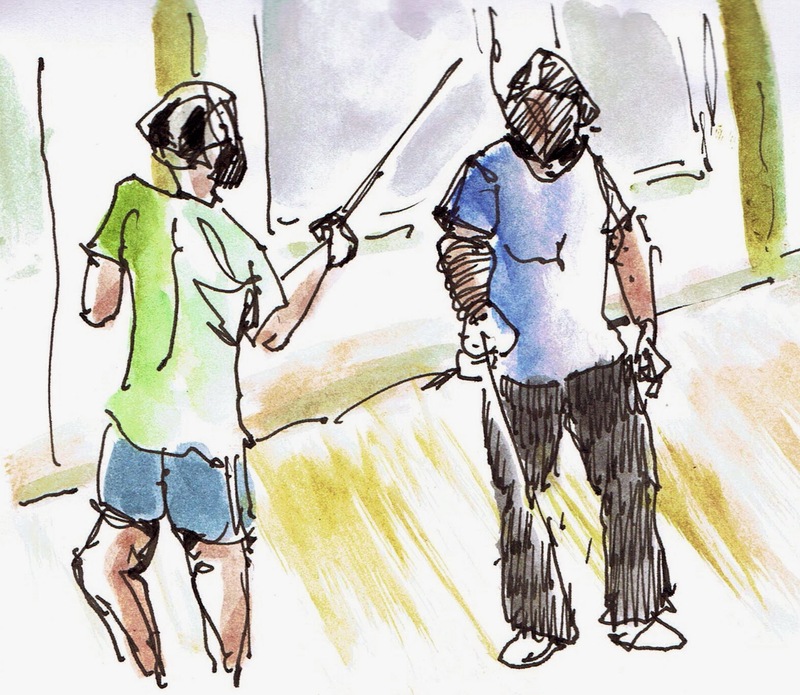 We've been invited to a late afternoon class at the Manhattan Fencing School. Drawing people is a challenge. Drawing motion is even more difficult. 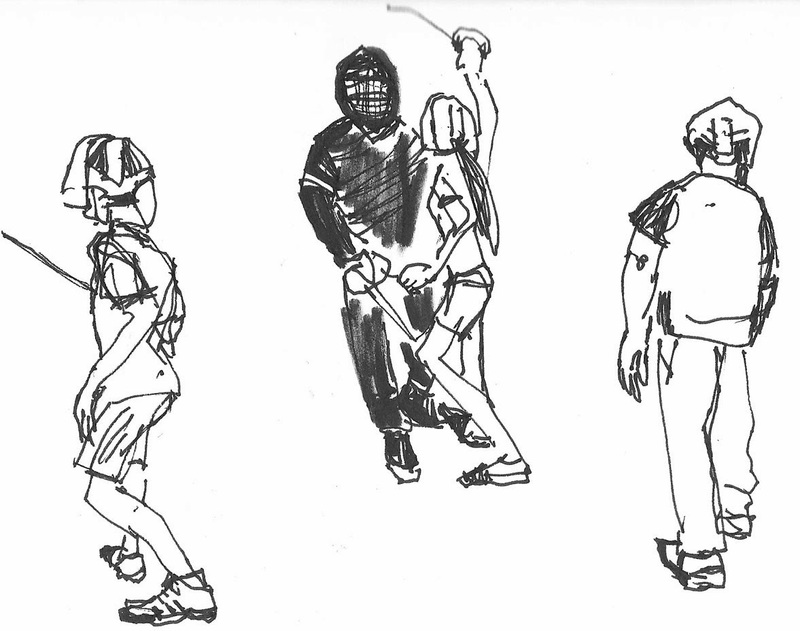 The classically beautiful moves of fencing will be our subject. 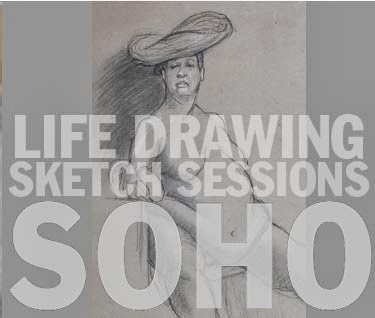 To warm up in the morning and to prepare for the challenge you're invited to the Spring Studio, considered by many artists to be the best place for Life Drawing in New York City. The class runs from 9:30 - 12:30. It's a popular class and the best seats are taken quickly. The class often fills to capacity. Minerva will teach short anatomy lessons during the breaks. Price: There is no charge. 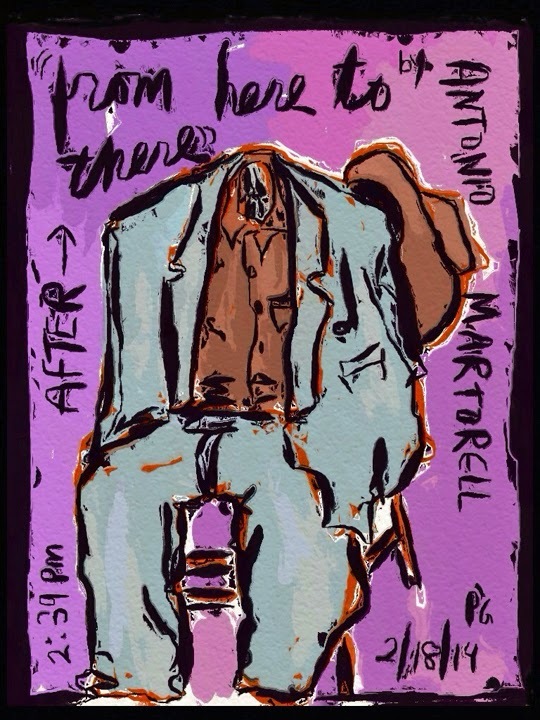 Between the two events we'll be sketching at Times Square from the streets, if there is a weather miracle, or more likely from the 8th Floor Lobby of the New York Marriott Marquis at 1535 Broadway at 45 Street. Since we weren't able to get together as a group on Saturday, Susan and I got together today and sketched indoors at Barnes and Noble Book Store at the Smith Haven Mall near us. 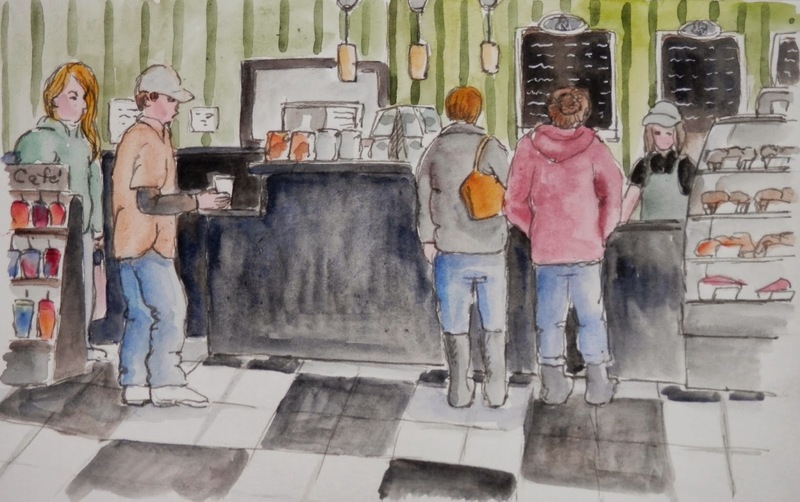 Of course there was a Starbucks there and the patrons are always fun to sketch. 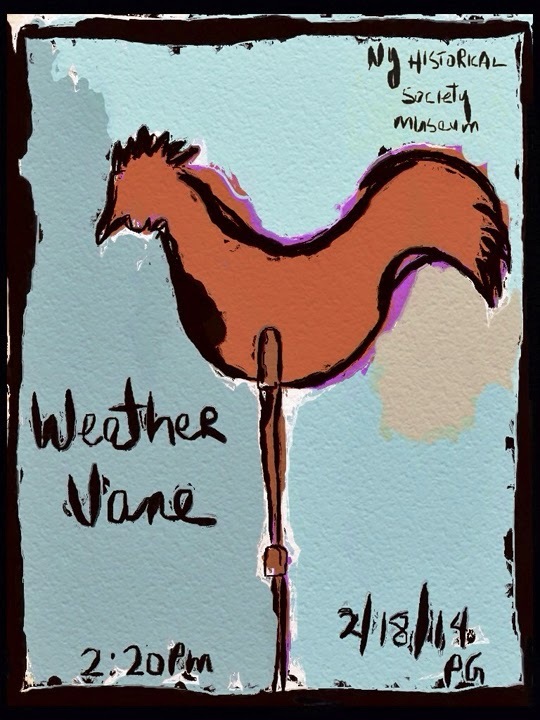 I'm not happy with this, but let's cancel the planned sketch date for tomorrow - February 15, 2014 scheduled for the Studio Museum of Harlem. My thinking is that the city is filled with snow, temperatures today will be over freezing, so there's going to be melting and flooding. Tonight it's going to drop below freezing so there will be ice everywhere. At just the time we're starting it's supposed to begin snowing with promises of 2 - 3" for tomorrow. There will be better days. FYI - For the following two weeks we're going to try starting at a later time - mid afternoon. I'll have details for you soon. 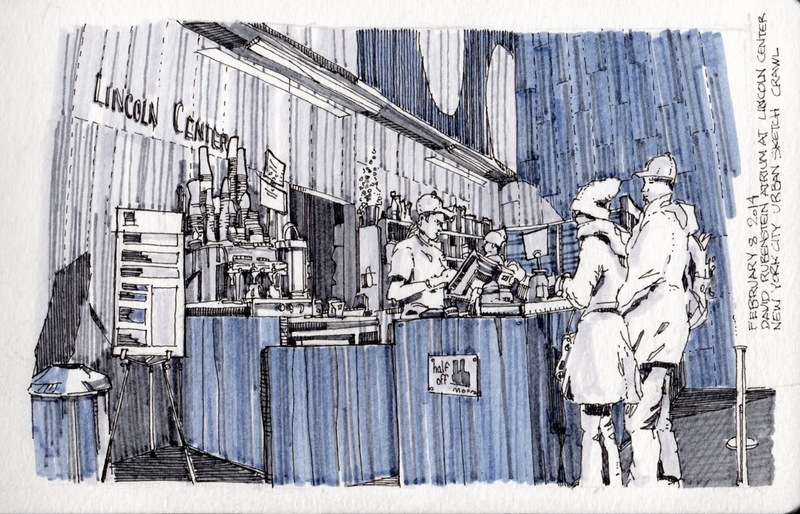 Urban Sketcher's at the Draftsmen's Congress from Mark Leibowitz on Vimeo. 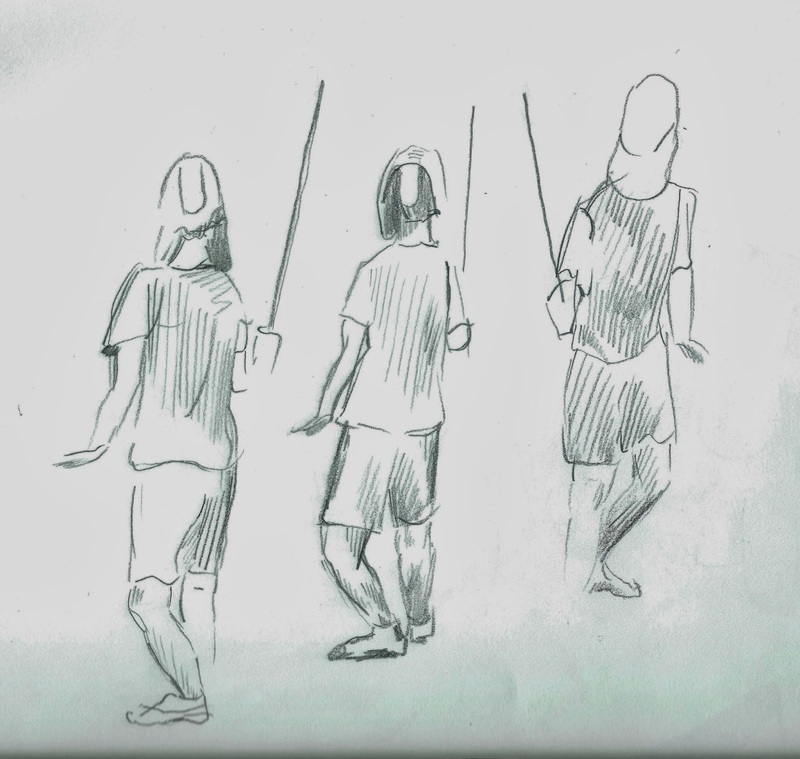 It seems that sketching indoors has pushed me to try new compositions that focus on groups of people rather than on the overall streetscape or individual subject. Although this was probably the largest number of people that I've ever fit inside any of my drawings, I still feel that I wasn't quite able to capture how populated and vibrant that place really felt. 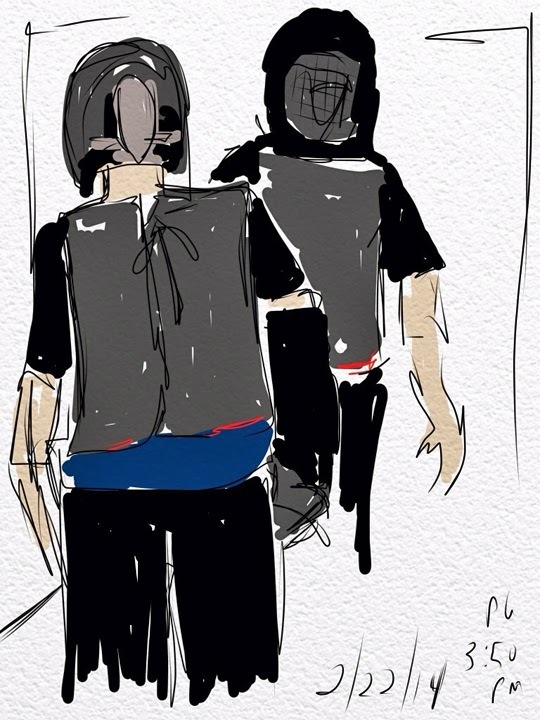 As a slow sketcher, I'm still struggling with my bias towards recording the "easy targets" - the stationary elements of the crowd that give me enough time to be drawn in "sufficient" detail. 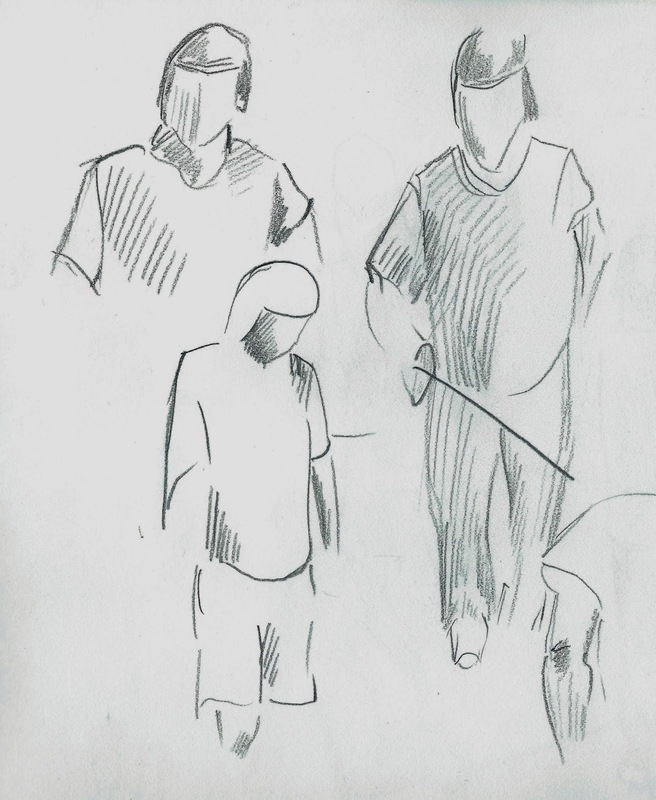 I'd be very interested in hearing other sketchers' thoughts on drawing crowds and "populating" a drawing. 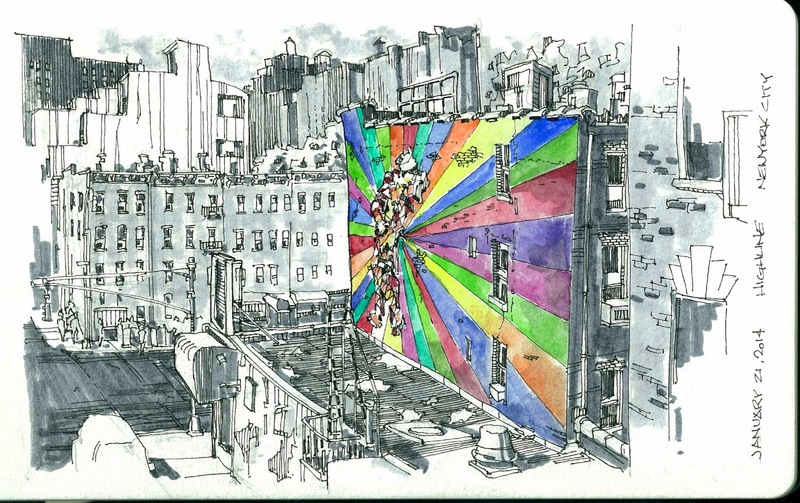 Highline, a colorful mural seen from the NY Highline. 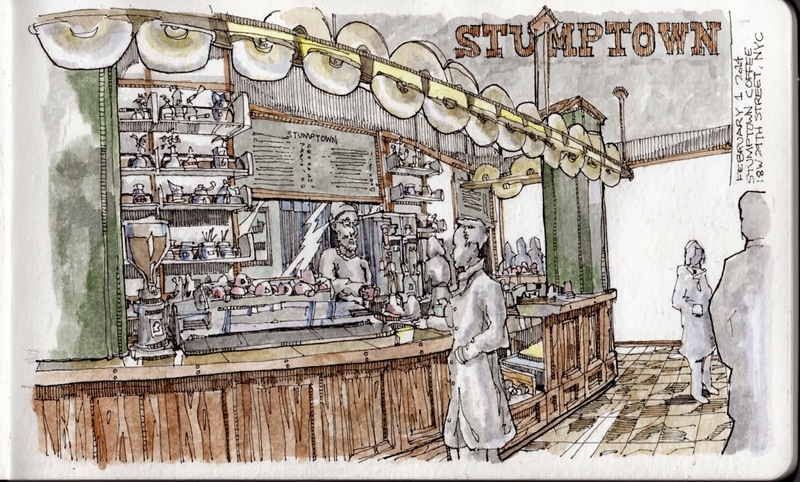 Stumptown Coffee Roasters. 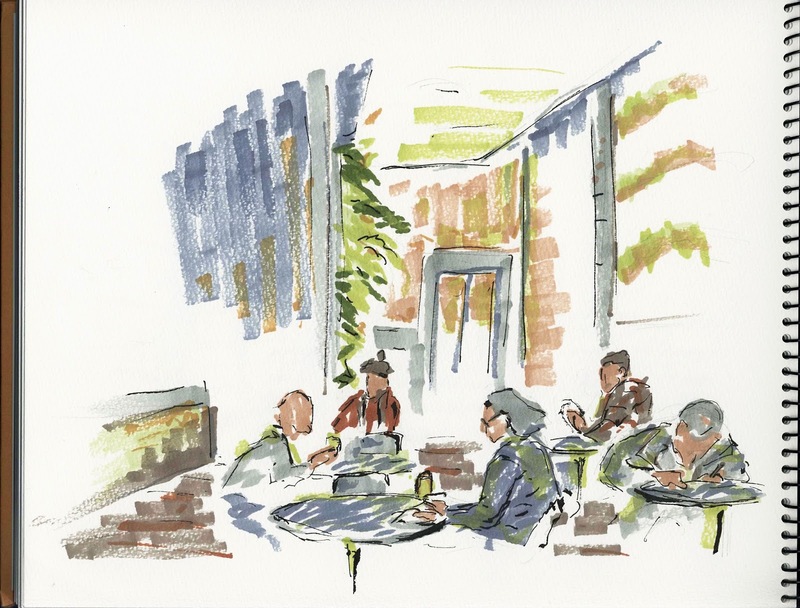 The shop is attached to the Portland Ace Hotel lobby which also be very fun to sketch. 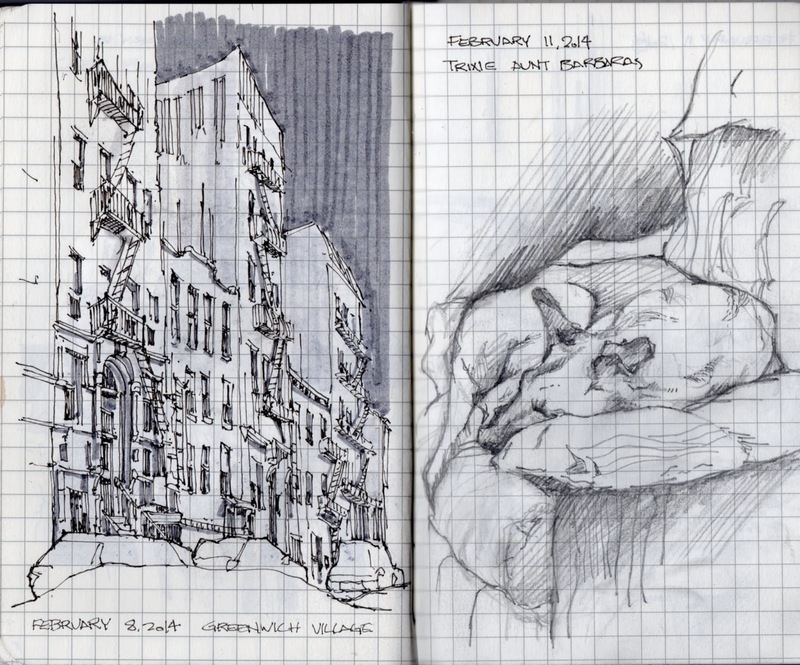 NYC Sketch Crawl. Saturday, February 8. 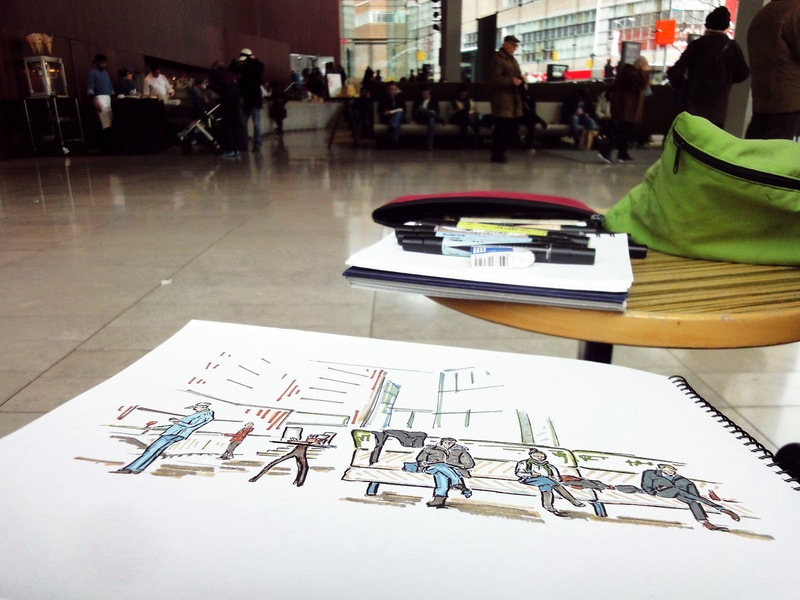 The first half of the day I chose to sketch the counter of the Cafe at the David Rubinstein Lobby in Lincoln Center. 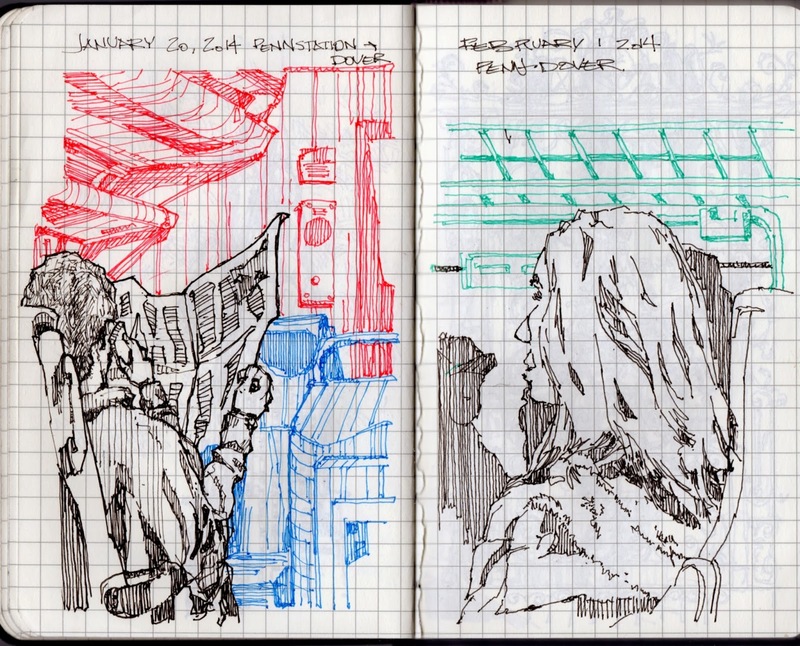 Then I chose to switch to a differed notebook and sketch people.